The "luminous blue variable" P Cygni shines at center in a beautiful setting in the middle of the thick Milky Way. Down and to the left are stars heavily reddened by intervening interstellar dust, which absorbs and scatters blue starlight more efficiently than red. 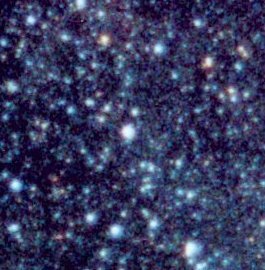 The bright "star" just up from the left center edge is the cluster Messier 29. (and uncertain) distance of 6000 or more light years, P Cyg, a class B (B2) supergiant (if not "hypergiant), pours between 500,000 and 900,000 times the power of the Sun into space from a blue-white surface of 19,000 Kelvin, making it one of the most luminous stars of the whole Galaxy. Dimmed a little bit by interstellar dust, if the view were clear, the star would appear 4 times brighter. P Cygni belongs to an extremely rare group of stars called "luminous blue variables." In the year 1600 it flared to third magnitude, and still sometimes carries the name "Nova Cygni 1600." (It is not a nova. True novae are caused by nuclear eruptions on the surfaces of white dwarfs from hydrogen donated by close companions). The eruption went on for six years, and then the star faded below naked-eye visibility, only to rise again for several years in 1654. Since settling in at 5th magnitude a century later, it has slowly increased its brightness (with many superimposed variations) by about 15 percent per century, not intrinsically, but as a result of cooling by six percent per century, which transfers progressively more of the star's ultraviolet light into the visible. Eruptions of luminous blue variables are accompanied by the ejections of vast amounts of matter. The star is surrounded by a faint nebula that has been created over the past 900 years by the current eruptive mass loss, and by faint shells that tell of eruptions from 2400 and 20,000 years ago. P Cyg is still losing mass at the astonishing rate of over three hundred thousandths of a solar mass per year at a speed of 300 kilometers per second. While that might not sound like much, it is 300 million times the rate in the solar wind. (Tech note: the wind induces odd features in P Cygni's spectrum, emission, or bright, lines that are flanked to the blue by dark absorptions. Such features, known universally as "P Cygni lines," granting permanent grand status to the star.) Highly evolved, and with an huge mass of between 50 and 60 times that of the Sun, the star will build an iron core, its only destiny someday to explode as a great supernova, or even as a newly-recognized "hypernova," one whose core may collapse into a black hole. When that may happen, however, is entirely unknown. Thanks to Luis Lopes, who suggested this star.